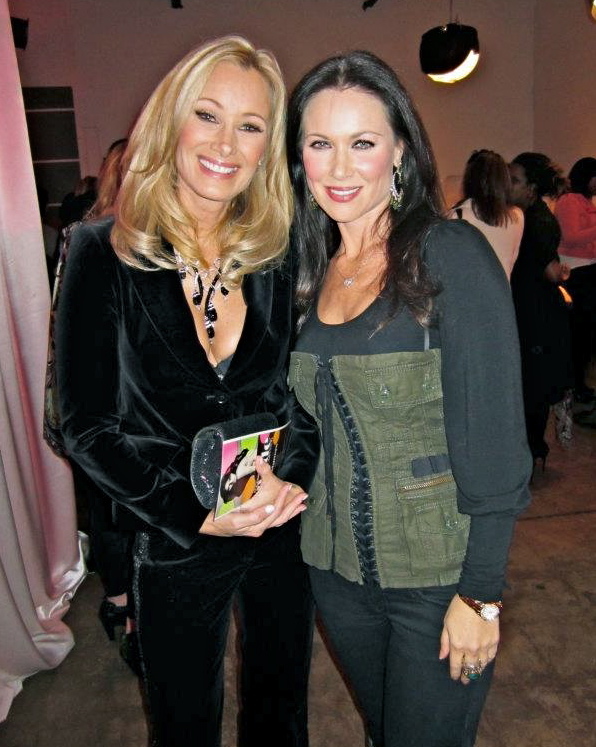 The last time The Ride talked to Texas native and model/spokesperson/actress, LeeAnne Locken, she was a contestant on TV Land’s She’s Got the Look where she had to contend with venomous snakes and an equally venomous castmate as she vied for the grand prize — a contract with Wilhelmenia Models. LeeAnne is back on reality TV in Style Network‘s Big Rich Texas (BRT, Sundays 9/8c), And this time she’s the one putting someone through her paces — Pamela Martin Duarte, who wants a coveted spot on the Board of Directors of The Fashionistas, the fashion non-profit headed by a don’t-take-no-[bleep] socialite Heidi Dillon, a woman who throws shade with astounding precision. Wait, I think I failed to mention that LeeAnne is a board member. Oh, it’s good the be one of the Queens. The Ride recently reconnected with LeeAnne. She chatted about BRT, what it’s like being back on reality TV and why all the interest in the Big T — Texas. The Ride: Hey LeeAnne! Thanks for taking time out of your super busy schedule to chat with me. Welcome back to the world of reality TV. What made you decide to do another reality TV show? LeeAnne: I LOVED being on She’s Got The Look (SGTL) and since coming back to Dallas after that show, this city has taken off with reality shows! I also wanted to help launch a national platform for a group of which I sit on the board and believe strongly in, The Fashionistas. The Ride: How has this experience been different from She’s Got the Look? I’m thinking no catwalk but still catfights and maybe a couple of crazy castmates. LeeAnne: This time has been VERY different. I get to come home every night, there are NO BIKINIS and NO MONKEYS! [laughs] Actually, it has been quite pleasant. I don’t shoot every day and they try and work around my work schedule which is GREAT! The director is actually the same one from my season, so that makes me smile. The drama is TOTALLY different since I’m not the target this time — Woo Hoo! It’s actually strange, the relationships between these women are CRAZY! Some of them TRULY HATE each other and hold nothing back! It’s crazy to watch and Heidi and I sit there sipping champagne in awe! The Ride: I love the intergenerational aspect of BRT — grown women paired with sassy young’uns. What three words you would use to describe the show besides, ‘big’, ‘rich’, and ‘Texas’? LeeAnne: EMOTIONAL~ DRAMATIC~ CATFIGHTS! !…Watching these women throw daggers at each other is…[a look of shock and confusion]. I thought Shelly behaved poorly on SGTL but OMGosh, some of these women make her look sane! It seems that almost all of them have something to say about each other behind their backs! I have NO IDEA where the loyalty lies or if there is any. This season is going to FABULOUS TV!!! The Ride: There seems to be a new found ‘fascination’ with Texas. There’s A-List Dallas and Bravo’s Most Eligible Dallas. Top Chef, took its most recent the season to Texas. And there is the new ABC comedy, GCB. What is it about the state that is so appealing to folks? LeeAnne: Well…Texas folk are AWESOME! We speak our minds, hold our ground and sometimes throw down when necessary! Look you may not like our attitude but you LOVE to watch us on TV! To live in Texas, you gotta BIGGER THAN LIFE! You left out two additional shows, Texas Women on CMT and Texas Multi-Mamas on WEtv. I’m telling you this city is BURSTING with reality TV crews. As for GCB, [I’m] in the pilot episode as Jo Beth Marie, Annie Potts & Leslie Bibbs ‘personal’ Neiman Marcus shopper. Annie Potts is freaking hilarious!! The Ride: Big Rich Texas features attractive, self-assured women of a certain age — grown women who are comfortable in their own skin and with their own sexuality. Some folks in some circles might call them ‘cougars’ or an acronym that begins with a “M”. When you hear those words, do they sound like nails on a chalk board and make you want to let out a high pitched scream that only dogs can hear? Or are you comfortable with them and all that they connote and are like, “Let the haters hate”? LeeAnne: I have learned a long time ago to NOT value what others think of me but what I THINK of myself. To hold myself accountable to MY STANDARDS. Which are really my grandma’s, God rest her soul. I like how the show is equally balanced with 3 married and 3 single. I choose not to drink anyone’s “hatorade”!! Call me or them or all of us what you like, it won’t change who we are or how we live. That’s the best part about being a woman of “certain age” is you are happy with yourself and that is all that matters! The Ride: Did you know these women before the show? LeeAnne: Yes! I knew one of the cast members before and I also happen to be the one who told her she should audition for the show. Since both She’s Got The Look and Big Rich Texas are produced by Allison Grodner, I was asked last year to help them cast Mother/Daughter duos who would be willing to participate in the show. I immediately asked my girlfriend, Melissa Poe, if she would be interested and BAM! She and her daughter Maddie got CAST!! I was so excited for them! I even threw their premiere watching party for them and we had something like 400 people there! It was great! Cabbage Patch Doll or Barbie? I had a ton of Barbies, but I preferred to build ramps, with the boys in the neighborhood, which we would try and jump with our bikes, which is also how the Emergency Room knew us on a first name basis! I’m a rare steak kind of girl. The bloodier the better! Yummmm. ….dates a married man! EVER! …says PLEASE and THANK YOU! Manners matter most! The Ride: I follow you on Twitter and Facebook and you’re always so positive sharing great words of encouragement and wisdom. How did you get to this place of positivity? I’d like a ticket to go there. LeeAnne: Thank you! I promise you I don’t wake up every morning all butterflies and rainbows. My grandmother was ALWAYS happy and never worried about life and growing up I saw an inner peace in her that I wanted. As I got older, I realized that peace is a choice, a choice we are allowed to make every day. So while I may not jump out of bed singing a happy little song, I choose, before I sit down to Facebook, what I would like to hear for that day. What would help me get inspired or encouraged to keep going. And then I post it to share with others and the dialogue that ensues ends up doing just that! My grandma always said, spread good will and GOOD will come! It’s one of my favorite quotes! The Ride: Speaking of positivity, you made a positive contribution to the life of Lauren Scruggs, a young woman severely injured when she walked into a moving helicopter propeller. You were instrumental in a fundraiser which helped raise money to pay for her medical expenses. We know what acts of kindness do for the recipients, but what about the givers? What kind of impact had this had on you? LeeAnne: A HUGE impact! I said YES before they could even finish asking me to emcee the event. I thought about what it must be like to wake up every morning and just for a quick second think, that was a horrible dream, and then remember — it’s real! My prayers continue to go out to Lauren and her whole family! I can’t imagine the emotional struggles not to mention the physical loss! I truly believe that with the amount of FAITH the Scruggs family has, Lauren will not only make a full recovery she will come back STRONGER and make a bigger difference in the world! God won’t bring you to it without bringing you THROUGH it!! I LOVE charity work! I love to help make a difference! I LOVE to HELP others! The Ride: Back to the show: What should we expect to see from you this season? My life is like a box of chocolates! Every day I hope a fudge filled one and not a coconut cream one! Yuck! Thanks so very much LeeAnne! Follow LeeAnne on Twitter at @LeeAnne_Locken, on Facebook, and check out her website, LeeAnneLocken.com.